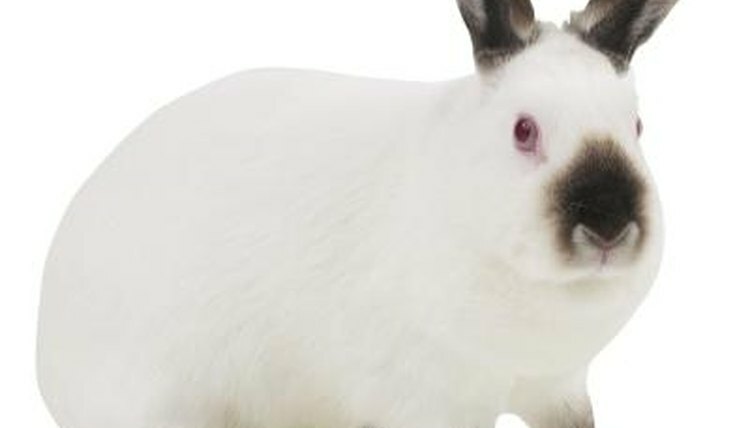 A rabbit may hold her hind leg up if she chipped a toenail, broke a bone or experienced a range of other problems. Limping is common and non-life-threatening, but may signify a larger problem that does require quick attention. Use context clues to determine what's bothering Fluffy's foot. Bunnies who lift a leg may limp from a minor muscle irritation or a more serious broken bone. If Fluffy appears to be limping or dragging a foot in the air, place her gently on the ground, and examine her feet for cuts, swelling or bruises. Check all of her toes to see if a foreign object stuck there is causing the foot pain. If you notice anything abnormal, contact the vet for an emergency appointment. If your bunny is holding her leg up and appears unwilling or unable to put weight on it, she could have a broken or dislocated bone. Schedule a vet appointment to have Fluffy checked out. A vet will prescribe anti-inflammatories to manage her pain and may either splint the foot, set a bone pin or select another method to repair the dislocated or broken bone. Your bunny can recover from these problems, although it can take up to 6 weeks for a splint to heal. Causes of limping include muscle tears, muscle cramps, lack of regular exercise, obesity, arthritis, soft tissue or bone injury, and infection. Bunnies do have delicate bones, so overexercise could lead to injury. Nervous disorders also may cause lameness. A vet can diagnose what exactly is going on with Fluffy and provide a course of treatment. If you notice any of the following, contact your vet for an emergency appointment: Swelling, dragging, an exposed bone or loss of feeling in the leg. Test for the latter by touching each leg and watching for a reaction. Ideally see a vet within 24 hours so your bunny has the best chance for a full recovery. While you wait, keep your bunny in a small space so she doesn't move around more than necessary and potentially make things worse. Always consult an experienced veterinarian regarding the health and treatment of your pet. House Rabbit Society: Sports Injuries -- Is Your Bunny in Shape to Exercise Safely? What Are the Causes of a Duck Limp?